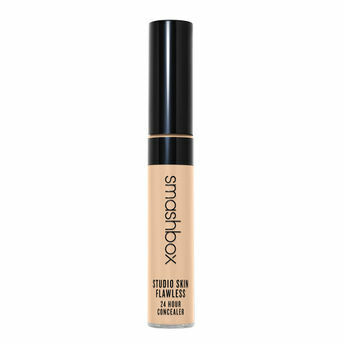 Conceal, correct, contour and highlight with Smashbox Studio Skin Flawless 24 Hour Concealer. This creamy, hydrating formula is sweat-, humidity-, and transfer-resistant. The soft, flexible wand hugs the contours of your face and under eye area, applying the perfect amount of concealer in 1 swipe. This liquid concealer with a matte finish camouflages imperfections with light-diffusing spheres without creasing, caking, or settling into skin. It gives skin medium-to-full buildable coverage that's waterproof with 24-hour wear. Explore the entire range of Concealer available on Nykaa. Shop more Smashbox products here.You can browse through the complete world of Smashbox Concealer .Alternatively, you can also find many more products from the Smashbox Studio Skin Flawless 24 Hour Concealer range.